Following the end of one trilogy, we have the beginning of another. For four long years, the Master Chief and his AI companion, Cortana, have been stranded in space, separated from humanity and everything they know. But not for much longer, as there’s a new threat looming on the horizon and the Master Chief is pulled from his impromptu retirement back into the fray once again. But this time, instead of Bungie, the creators of the Halo franchise at the helm, there’s a new kid behind the wheel. 343 Industries, the new studio dedicated to all things Halo since Bungie partnered up with Activision, has the chance to prove they have what it takes to handle one of the most recognizable and critically acclaimed franchises in gaming. The single player campaign kicks off with a highly entertaining first mission and keeps a fairly consistent tempo throughout. Unlike many shooters these days, Halo opts for a more organic feel in its level design and conflicts, inspiring players to take their own approach to battles, be it straightforward running and gunning, capping enemies from a distance or getting into a tank and blasting your way through. This is the kind of organic(-ish) choice that separates Halo 4 from games like Call of Duty: Black Ops 2 and Battlefield 3. Granted, Halo 4 doesn’t allow for the same kind of freedom a game like Far Cry or Crysis would but the more open levels and lowered emphasis on “go here and shoot these three guys who will always attack from this point” scripted sequences is a welcome change of pace from typical shooters. 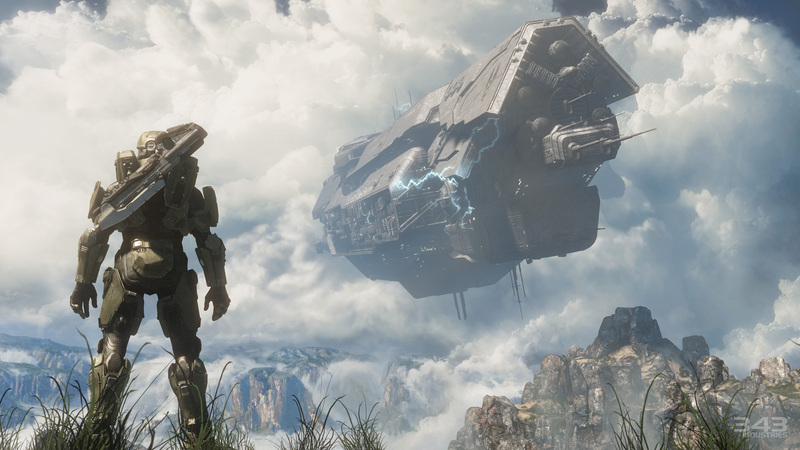 I freely admit that I like the far more cinematic and character driven presentation that 343 engineered for Halo 4. The Master Chief feels less like a machine in a suit of powered armor and more like a person…in a suit of powered armor, something I don’t feel Bungie was able to accomplish in three games. Granted, his performance and characterization aren’t likely to win any awards but this is a step in the right direction. 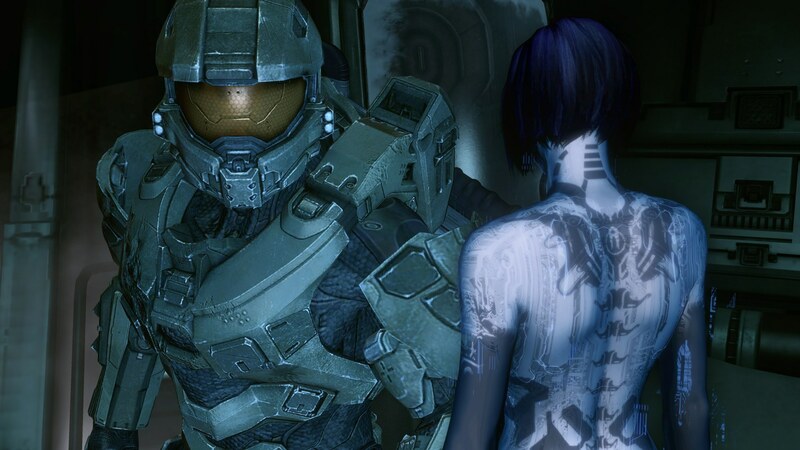 The relationship between the Chief and Cortana is more fleshed out than it ever has been and the ways in which they interact as she copes with her rampancy throughout the campaign is well done. What I didn’t like is that, similar to Bungie (and too many other game developers to list); 343 presented far more questions than it attempted to answer. One can imagine that 343’s writers are trying to lay a foundation of intentionally unanswered questions and loose ends that they’ll build upon in upcoming sequels. Perhaps, but some miscues in storytelling that go against established Halo canon makes me inclined to believe that it’s simply sloppy writing. Despite some issues with storytelling, the campaign experience is remarkably solid from beginning to end. The campaign doesn’t take long at all to ramp up and soon, you’ll find yourself sucked into the gravity well of an ancient Forerunner planet called Requiem and embarking on a new adventure, battling against the Covenant (whom I thought for sure we had a truce with), and a new threat, the cybernetic Promethians, an enemy type I have mixed feelings about. The Promethians come in three primary forms. First the Crawlers, small and agile dog-like robotic creatures that dart around the battlefield, attack in packs and can climb walls. These are, by far, the most entertaining of the new enemies to fight. Simply taking cover against them isn’t enough, because they’re quick and clever enough to flank you, which keeps you on your toes. As for the other two new enemies…well, I’m not really a fan. The Watchers, which hover above the battlefield as the Promethian support team, are rather annoying to contend with but are easily dispatched (which you’ll want to do, as soon as you see them). The Promethian Knights are the big new enemy type present on the battlefield and are easily the most recognizable of the new enemies. They have a number of offensive and defensive abilities, such as the ability to teleport away from danger when taking fire and charging you with a built-in energy sword which forces you to respect their presence because ignoring them is a good way to end up dead. The problem with the Knights is that they simply take too much damage and give you very little feedback that you’re actually doing real damage to them. They’re bullet sponges of the highest order and while they were certainly challenging, they weren’t for the right reasons. Despite or perhaps because of some glaring similarities to previous Halo games, Halo 4 ends up being a very entertaining game altogether. 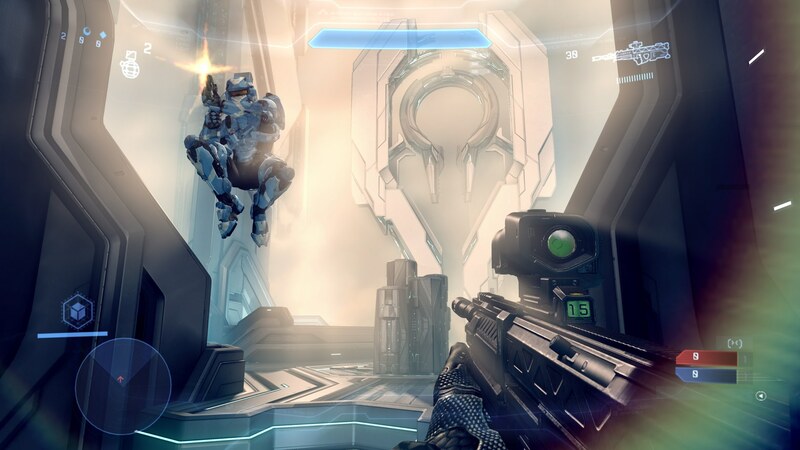 If you’re not a fan of Halo’s particular brand of first person shooter gameplay, Halo 4 is unlikely to change your mind. 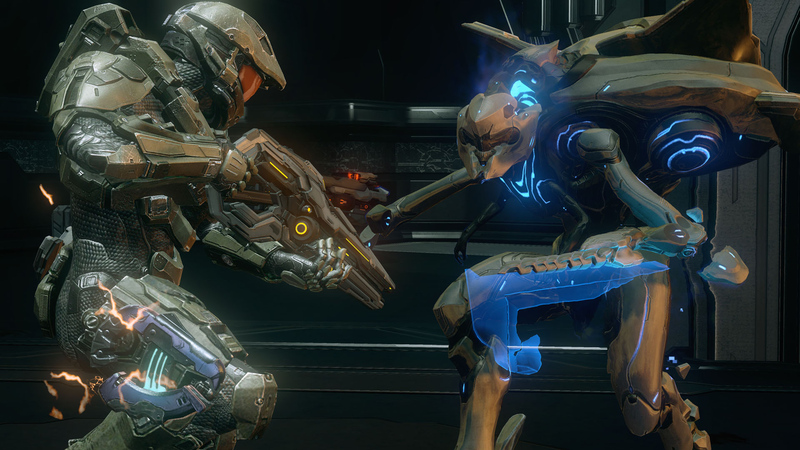 The changes to the Halo formula simply aren’t significant enough to radically change the way the game plays. But, if you’re an ardent Halo fan, you should feel right at home the instant the Master Chief steps out of his cryotube and raises his gun. This doesn’t break any new ground in the FPS genre and I don’t think it’s a revolution even compared to other Halo games. Halo 4 is, however, a consistently entertaining game from beginning to end, more so than its predecessors. Pervading the experience is the unmistakable sense that this is more Halo. As the sixth Halo game in the series (including the canon spinoff ODST and prequel, Reach), it’s hard to deny that the Halo franchise is getting a bit long in the tooth and the gameplay formula that has been tried and tested throughout the years is immediately familiar, perhaps too much so. Despite this being the least Halo-like of the Halo games, it still feels like Halo. The weapons respond the same, movement feels the same, even with the added permanent sprint function, melee feels the same and throwing grenades feels the same. As a result of this feeling of familiarity, conflicts both in the single player campaign and multiplayer contests feel similar to previous games. 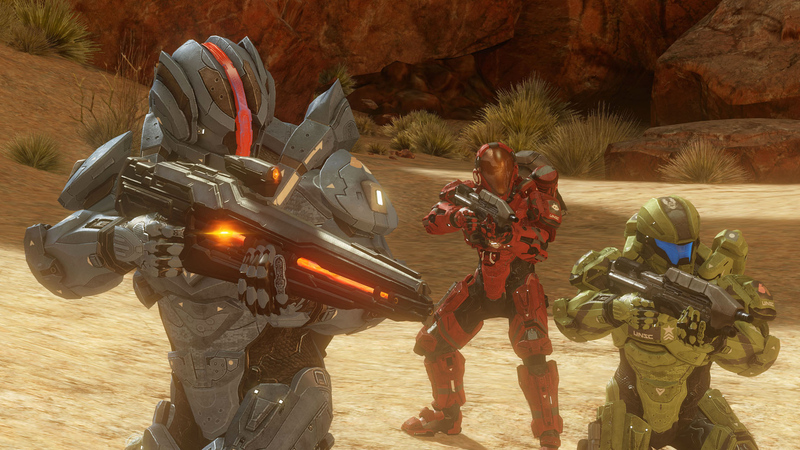 Halo 4’s multiplayer is…well, Halo multiplayer. Campaign co-op is in full force and there is a new singleplyer and cooperative mode, Spartan-Ops, which takes the place of Firefight. These little side missions are rather entertaining and the CGI intro movies are fun to watch but I’m not sure if it serves as a suitable replacement for Firefight. But as a complement to adversarial multiplayer and the campaign, it’s a fun little diversion that adds more context to the story of the UNSC Infinity. Some changes have been made to the formula that continues in the direction Bungie started taking Halo games with Halo: Reach. 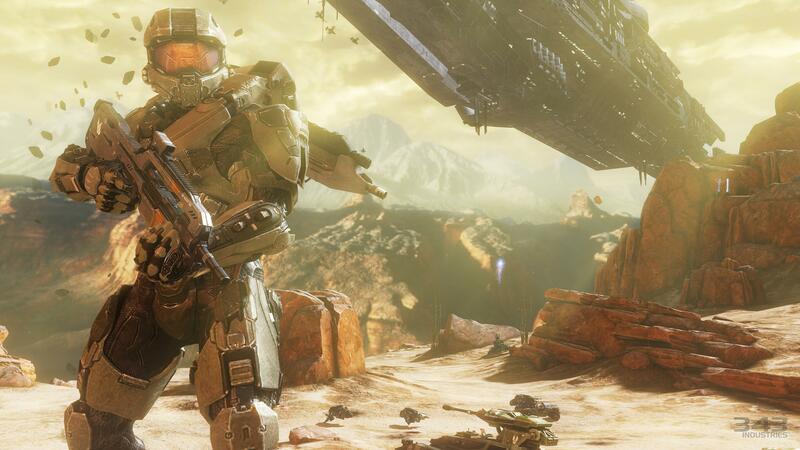 The result is a multiplayer mode that is still distinctly “Halo” but with a few tweaks that liken it to Call of Duty. This time around, there are five customizable loadouts to choose from and a suite of new armor abilities and weapons to outfit your Spartan with. Because of this, there are fewer weapon pickups available on the battlefield and those that do remain spawn more randomly which places more emphasis on using the entirety of the map rather than camping specific locations for power weapon drops. Speaking of power weapons, Halo 4 introduces the ordinance drop system, which rewards players who consistently rack up points during the course of a match with random power weapon and equipment drops, similar to Call of Duty’s care packages. These rewards are entirely random though, to encourage players to mix things up. The lack of fixed weapon spawns is a significant change that adds a layer of unpredictability to the multiplayer that Halo has never had before which will probably be a turn off to some longtime fans. One of the less subjective downsides to the 343 engineered multiplayer is a much decreased emphasis on custom games. Unfortunately, the highly customizable custom game modes for playing with friends have been pared down rather significantly. These issues add up to a multiplayer mode that’s certainly entertaining but feels rather unpolished. A bit more time to work out some of the kinks in the netcode and weapon balancing (or…you know…a public beta test) would’ve helped but for now, we’ll have to wait to see what 343 has in the update pipeline. Visually, this is a strong contender for the title of the best looking console game on the market. Sporting a heavily tweaked and reworked graphics engine, Halo 4 pumps out expansive jungle and desert vistas, complete with excellent lighting (if overblown at times) and great post processing effects and a mostly consistent framerate (the only drops I noticed were in Spartan Ops when the action got a bit hectic). The game has to be seen in motion to be truly appreciated. Sure, PC gamers have no reason to feel threatened by the seven year old Xbox 360’s capabilities but even after playing PC graphical heavyweights, I was rather impressed. There were more than a handful moments in the campaign when I had to stop and look around at the beautifully rendered scenery and mouthed “wow”. It’s certainly not often a console game evokes that kind of reaction to its visuals. The sound design, on the other hand, I’m a bit less positive about. Voice acting is great, as usual but some of the new weapon and vehicle sounds are…off. The DMR sounds appropriately powerful but the Battle Rifle sounds weak, as does the Sniper Rifle and I’m not a fan of the new Warthog sound, as it sounds more like a dirt bike than a four-ton SUV. Nonetheless, you’d be hard pressed to find a better sounding game out there, even with some of the…interesting choices 343 has made. The musical score is excellent (the best score since ODST) and features an exceptional new theme for the Master Chief. With Halo 4, 343 Industries has proven beyond a shadow of a doubt that they have the chops to carry on the Halo legacy and improve on the foundation that has already been laid with a consistently great campaign and multiplayer that mixes things up a bit more than previous entries in the series. 343 Industries has proven that they have the talent to pick up where Bungie left off and produce a great, if a bit predictable, follow-up to Halo 3 and a new era for the Master Chief.